Complete EdgeRunner specifications can be found here. Our solid, stable, and safe KickBack 3 is now included with all bikes and ebikes. You can read more about it here. Keep the water off! 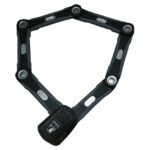 Specially crafted out of high grade aluminum for the EdgeRunner’s wide tires and different wheel sizes. 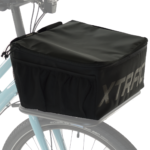 Ample storage for groceries and other medium-sized items with a velcro closure. Sold individually. If you want one for each side, please order 2. Mounts directly to the frame. 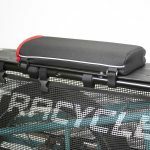 Its open-ended design gives you the option to carry almost anything. 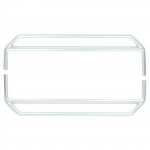 Add a PorterPack for enclosed storage up front. 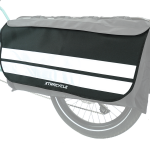 Add more enclosed space, handy if the bike is loaded with kids or you need easy access up front to snacks and things. SlingSets carry bulky stuff: kayaks, ladders, strollers, bags of chicken feed. They come as a pair, and you can add CargoBays for enclosed storage. Two passengers’ worth of padding that covers the FlightDeck. 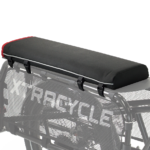 Use two with a Hooptie to create comfortable, padded backrests as well. This half-FlightDeck cushion is perfect for when you have one child in a Yepp seat and one that is not. Keep kids safe and secure while riding on the rear deck. 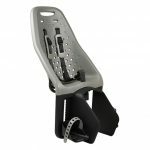 Double rail system for hand protection and width adjustable for any size passenger. 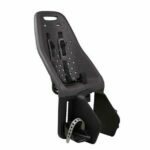 A smart, safe child bike seat (includes mounting adapter). If you need just one seat, we recommend mounting it at the rear of the deck. An add-on for the Cargo Bay, with wide reflective stripes and extra weather protection. Sold individually. If you want one for each side, please order 2. 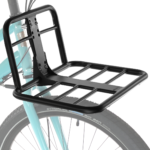 More support for heavier cargo; foot rests for larger passengers; and make it a breeze to tow a kid’s bike. The BORDO GRANIT XPlus™ 6500 Folding Lock is a high-security lock in a class of its own. Highly recommended with your EdgeRunner or Leap. A bright, easy-to-operate battery headlamp from Herrmans in Finland (not necessary for electric-assist Edgerunners, which come with lights included). And that’s not hyperbole. The 8E is my favorite possession. I can ride my kid to school, camp, the park, the store, everywhere….she loves it and so do her friends – I can fit three 7 yo’s on the magic carpet. Riding this bike is fun. It’s like a racing bike hidden inside a cargo bike. For hauling a kid, you need a magic carpet, a hooptie and, importantly, u-tubes. I live in Boulder Colorado. We have hills. I never thought that I would put my 21 month old son in a child seat, climb 1800 feet to the top of a beautiful dirt road climb, but the Xtracycle Electric EdgeRunner made that possilbe for us. We had three bars out of five at the top of the climb. I have loaded this bike up with all kinds of passengers, and cargo – it rocks. I have avoided driving my car for many errands and am just as fast, get fresh air and have rockstar parking wherever I go. I love my new bike! I rode a FreeRadical for years, built on 700c wheels. As my kids got bigger, it became clear to me that I needed a bike built for their weight. The EdgeRunner is just the thing. The small wheel size in the back keeps the kids low to the ground, and makes the center of gravity far easier to manage. The fat, burly tires keep everyone comfortable and have me cornering with confidence. I’m especially grateful for the geometry of the frame. With a simple seat adjustment, but bike works for 6’2″ me and my 5’7″ wife. It is truly a family bike. With the added luxury of electric assist, the bike has become a viable member of our commuter fleet and has allowed us to sell our second car. Soccer practice up the hill? Groceries, bookbags, and boys? No problem. The EdgeRunner conquers all. I want a custom side car or bracket to hold a canoe, or a surf board. 5 out of 5	It is worth every penny! Probably as everyone else who are not millionaires, we were concerned about the price. It was an expensive purchase – with all the accessories we needed to make that work for us it was over $5,000 – so that was difficult to make that commitment. Was it worth all of the money? Would it be risky to ride with the kids? Were we going to really use it enough to justify expending 5k!?! I can only say that it is worth every penny!! The bike is super high quality, amazing to ride, safe, and kids are absolutely in love with it (so are we)! Plus there is not need to looking for parking anymore!! 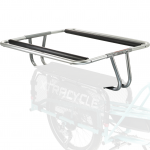 We couldn’t be happier with the Xtracycle solution for our kid and cargo-carrying needs. Our 5 year-old passenger is pretty pleased too, and sometimes she climbs into the bike when it’s just parked and not headed anywhere. Not only haven’t we found anything we don’t like, we like riding the bike without kids and cargo! This electric assist bicycle has changed my life! After my road bike was stolen living in SF I delayed replacing it since my riding was limited with young children. Since buying Edgerunner I commute on my bicycle more than ever: I can go further faster, the ergonomics of the bike are better than a road bike, I have plenty of space in the side cargo bags (highly recommend for groceries, kids stuff, layers, locks, etc.) and it makes short errands faster than a car when you consider seat belt and parking time. One benefit I hadn’t considered until a recent experience is the fact that riding this bike greatly extends the length of the family ride. Once upon a time a family ride could only be 2-3 miles tops, but now, if we go for the 20 mile ride and our six year old is pooping out we can load him and and bike onto the Xtracycle and make it back with out a melt down. My new Xtracycle arrived yesterday. It is a joyous bike. I have all kinds of bikes — touring, road, mountain, gravel, travel, tandem (and travel tandem). So I have definite opinions about bikes. This bike does what I need a cargo bike to do. I looked at the whole field of cargo bikes. 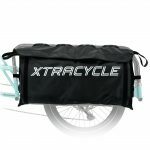 Even though I didn’t get to ride an Xtracycle before I bought, I felt confident that this was the bike. And it is. I took it for its maiden voyage to the grocery store and it was just great. So thanks. I really appreciate what you guys do. I live in the foothills of Simi Valley, so anytime leaving my house there are hills involved. I have been looking for ways to ride with my twins. The trailer option just didn’t work for me with all the crazy drivers. So I found the EdgeRunner 9E. I have it outfitted with 2 Yepp Maxi Easyfit bike seats. This bike just makes the hills go away. It is great to ride and wouldn’t even know my boys are on the back if they weren’t laughing along the way. I can get about 20 mi with my boys on the back and that includes several miles of up hill (I’m a bit old so I use the Turbo setting a lot 🙂 ). I plan to get another battery, cause we often want to go even further. The components on the bike are top notch and the stopping power is great. The kick stand is excellent as it allows me to load and unload my boys without any help. This is a great bike! Lots of fun for me and my family. I highly recommend it. I am able to pickup my daughter after work without having to get in my car. I had resisted riding my bike to work because there are a lot of big rigs in the area that I live but having an electric motor to assist me provides that extra confidence needed. The pedal assist mode provided by my electric motor makes it a breeze and comfortable when riding next to other cars in busy streets. The bike is very maneuverable. I bought our Edgerunner this summer after we had our 2nd kid, since I didn’t want to buy a double wide trailer. Previously, I’d been hauling our 4 year old around in a single trailer with my cyclocross rig, which worked ok but lacked much cargo space for errands. Riding with a trailer also really affected the handling of the bike at I always felt a bit sketchy riding in traffic with it.Once we got the Edgerunner, it quickly became our favorite ride and the trailer has been permanently retired. 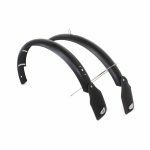 We opted for the 27D Lux package, since full time fenders & lights were something that made the bike really practical for full time use, in any weather, day or night. I could not be happier with the full coverage fenders and the lights. The generator hub paired with the Luxos is an awesome combo, and I get stopped with questions about the lights about as often as I get stopped with questions about the bike (which is a lot). 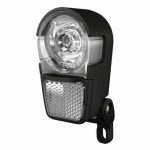 They’re crazy bright, with high and low beams so you can ride with confidence on even the darkest unlit roads or paths. “I didn’t see you” is something I will never hear from a driver again.The bike itself handles great, loaded with groceries, kids, a day worth of supplies for the beach or park… we take this thing everywhere, fully loaded. The 20″ rear matched with the 27 speed drive train really handles the hills here in Vermont with no issues. We even won a hill climb event against some people on tandems (even though my stoker is just an onboard cheering section).Even when I don’t need the extra carrying capacity, I often find myself taking the Edgerunner anyway, just because who knows what I might need to pick up along the way. The ride is a lot more comfortable and smooth than my regular commuter, and it is just nice to know that if I have to run an errand I don’t have to try and jam a bunch of random stuff into a backpack or messenger bag.Bottom line: this is probably the best bike purchase I’ve ever made. I’ve got nicer bikes, lighter bikes, but nothing matches the Edgerunner for total days/hours of use… I can leave the house in the morning, do drop off at school, run errands at lunch, pick up groceries & the kids and never have to worry about not having room for something. I even got our Christmas tree with the bike, after doing some grocery shopping and picking up some supplies at the hardware store. 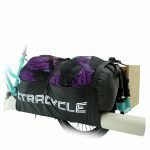 There is really nothing I don’t love about my Edgerunner and Xtracycle gear! I’m reminded every time I take my kids to school in the morning and in particular, every holiday season in NYC when the city is packed with tourists staring up at the big, big buildings as they do their holiday shopping as I sail through/around/between traffic on the Xtracycle uptown and down.This season I’ve transported everything from my kids to bags of gifts to bags of donations to a 7 foot Christmas tree. What’s there not to love?! I owned another cargo bike who shall remain nameless – and it was bad. It wobbled, it was unsteady, when my kid gestured the whole thing would head in a new direction – no ok. I test drove the Edgerunner – with my kid – and it was love at first ride. I sold my other cargo as quick as I could and signed up for the first delivery of the Edgerunners. I got my bike in December of 2013 and basically have ridden it daily ever since. We live in San Francisco and I drop my kid off at school – u and over one of the west side mountain ranges, then back over an I head to work in the Mission. After work, its a reverse commute. During the week I’ll stop at Rainbow Costco or TJs for groceries and haul them back across town. Weekends? Lets go to the zoo, GGP. Crissy Feild – it’s all doable with our Edgerunner.At least one person a day asks me about our bike, I’m pretty sur emost of them are new Edgerunner owners too! This bike is a life changer. My wife and I use it primarily to haul our 17 month baby around town. What was once a chore — getting the bike out, getting the trailer out, hooking it up, putting the baby in, and being careful and mindful of our doubled width — is now a joy. Just pull out the bike, put the kid in, and go!Ada loves it, too. She hi-fives us as we ride and babbles and points to all the cool stuff she can see now that she’s not stuck in a car.We also use it to haul groceries, which is not quite as fun as hauling our kid, but it’s still pretty rad. I’ve been riding my EdgeRunner for almost 2 years and love every minute on it, even on uphills with two kids telling me to go faster. It really does ride like a regular bike– it is easy to maneuver and has plenty of gears for up and downhills– but is a bike with lots of perks. Depending on the day, we carry extra bags, extra gear, extra kids and extra bikes. One of the things we like to do is go for a long ride with the kids on their own bikes. When they get tired it is easy to hook their bikes into the cargo bags and give them a lift home.We bought the bike as one that my husband and I could share, but it quickly became the only bike I ride; sometimes my husband gets a chance. (It fits both of us very well, I am 5’3″ and he is 5’10”.) My usual ride (school drop off) is 10 miles with several steep hills . . . and lots of rain. The kids (and I) love it rain or shine and complain when we have to take the car.Although the initial cost of the bike may be off-putting, it is an investment that has payed off in myriad ways for our family: the kids are hooked on biking, we’re able to integrate biking into everyday activities like going to school and the grocery store, and, most importantly, it is a blast. Perfect for commuting with my two kids (ages 3 and 1) on the back, and the electric assist lets us make it up the steep hill we live on. Handles well on city streets. The front cargo bag is very convenient because the kid seats obstruct the rear bags. Love my new bike. The riding and shifting is so smooth with the Nuvinci Hub. It’s great to drive my electric bike in San Francisco. Well, this bike is everything we wanted. The new Bosch drive is excellent. Couldn’t be happier. Now we can go places with both our kids and all their stuff without any fuss or tears! It’s smiles all around as soon as we get on our Xtracycle.